1995 was a busy year. Microsoft launched the long-awaited Windows 95. The unmanned Galileo spacecraft arrived at Jupiter. Pixar released Toy Story, the first ever animated film entirely generated on the computer. However, you wouldn’t be reading this article if developers from Sun Microsystems (which later merged with Oracle Corporation) didn’t introduce and deploy Java back in those days. Years passed, but the old good Java is not going to yield its position. Instead of fading away, it is growing strong, and at the present moment it may even boast that some of the developers who code in it are younger than the actual language itself. It still has one of the largest crowds of followers and is constantly evolving to satisfy the ever-changing needs of the community and businesses around the globe. Java development services cover a wide range of applications, from peer-to-peer, open source and embedded to wireless and JXTA applications. 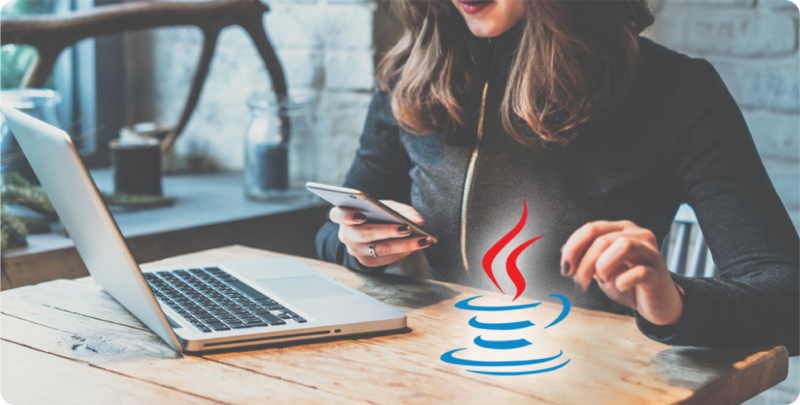 Java has been the most widely popular programming language in the world of application development, according to the TIOBE index. The Qulix Systems Java team has reviewed the current technologies for Java app development and worldwide software development trends which influence the platform. Below is our selection. Please help yourself! If you haven’t been living aloof from the world, you might have noticed that the former practice of Java major releases every three years has been shifted. As work on Java SE 9 was progressing in 2017, some started wondering if there was a way to evolve the Java SE Platform and the JDK at a more rapid pace. To the joy of the Java software developers’ world, Oracle now reliably produces new versions twice a year, in March and September. Java followers no longer need to cope with tons of changes every couple of years but rather manage them on a faster, more predictable basis. These changes can vary from a significant feature to small maintenance enhancements, bug fixes, and documentation improvements. 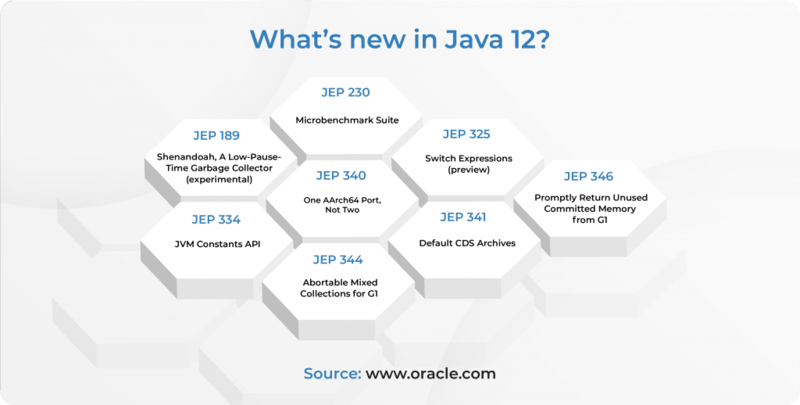 The latest version, Java SE 12, was officially released by Oracle in March 2019. 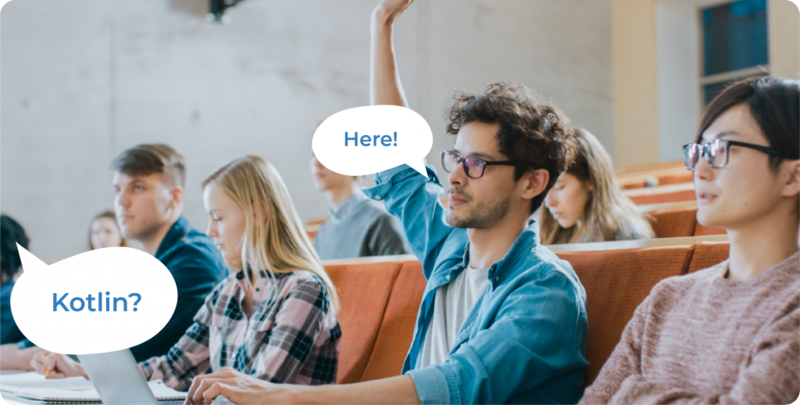 Welcome to the Java Language School! One of the most extensive trend Java application developers have to adhere to is the widening range of languages used in the Java virtual machine (JVM). Scripting languages such as Python, Ruby, R, Scala, Kotlin, Clojure, C, C++ are receiving widespread attention. Kotlin, really? We agree its fan base might not be the largest compared to other programming languages, but as RedMonk’s biannual review suggests, Kotlin has leaped from number 65 to number 27 in less than a year. This is certainly an achievement but it’s no surprise. At present, mobile app developers can choose from two official programming languages for Android development — Java and Kotlin. Hence, Java is no longer the default programming language for Android app development. In addition to running on the JVM, Kotlin is also 100 % interoperable with Java and designed to be adored by Java developers. Classes written in Kotlin can be mixed up with classes rendered in Java and the solution will work smoothly. On the other side, Kotlin, as opposed to Java, comes with specific functionalities to simplify Android app development and app code maintenance. In addition, it has a number of language features which address common Java issues. But most importantly, Kotlin is currently the first-level language for Android app development. Google’s appreciation for the language and the commitment to provide support to Kotlin means a lot for its future advancements and popularity. You won’t be another Columbus, if you suddenly switch to reactive programming, but it’s more relevant than ever before. The volumes of data are skyrocketing, and the computational power is on the increase. Users crave for software integrity, quick updates, and continued synchronization. Processing numerous events becomes a pain in the back(end) for Android developers. It’s high time to opt for a programming paradigm where you define the source of data and the consumer of that data. RxJava 2.0 is one of the latest Java technologies to help you with this growing challenge. Basically, it is the reactive extension (or, to put it another way, API for reactive programming) for the JVM. When you connect the consumer to the source of data, RxJava pushes this data to the consumer. This library can assist developers in creating asynchronous, concurrent and resilient Java applications. It also makes the code look less bulky and more sophisticated. To make developers’ life a bit easier, smart people came up with another tool, Spring 5.0 Framework. This platform provides a comprehensive programming and configuration model for contemporary Java-based enterprise applications on any kind of deployment platform. Although the framework does not impose any specific programming model, it has developed its status in the Java community as an addition to, or even replacement for the Enterprise JavaBeans (EJB) model. 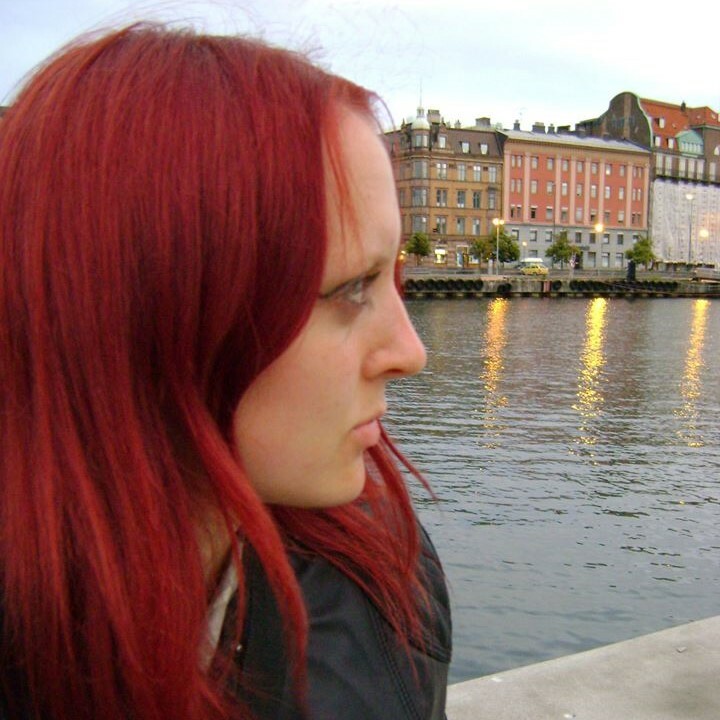 The wind of change is coming from the R2DBC (Reactive Relational Database Connectivity) project as well. It allows to stream data asynchronously to any endpoints that have subscribed to it. It introduces a new API that allows asynchronous, non-blocking code which works efficiently with relational databases. In addition, R2DBC supports cloud native apps where relational databases like PostgreSQL, MySQL, and others are found. Java developers are not cloud-free. 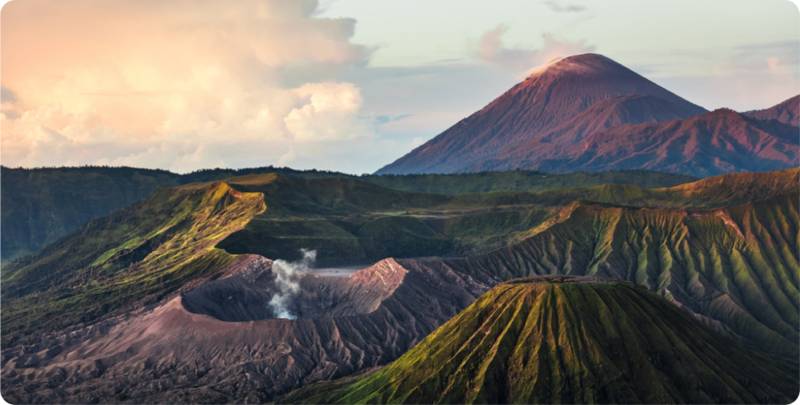 In order to accelerate cloud native application development, leading Java development companies collaborated to move Java EE technologies to the Eclipse Foundation, where they will evolve under the Jakarta EE name. Eclipse MicroProfile utilizes existing Java EE tools (e.g. AX-RS, CDI, JSON-P) and combines them with new ones to create a baseline platform optimized for a microservice architecture. The three most crucial areas that developers want Jakarta EE to prioritize are better support for microservices, native integration with Kubernetes and faster pace of innovation. Java is applicable pretty much anywhere, and data processing is no exception. No matter which trendy framework you prefer, be it Apache Spark or Hadoop, there’s always a well-supported Java client to work with. Not to mention clients for all sorts of NoSQL or SQL databases. No one says that Java is perfect. It is a wordy programming language, so it won’t be the best option for R&D or statistical apps. As a consequence, data scientists prefer dynamically typed languages like R and Python instead. However, Java is successfully being used in Data Science owing to its performance indicators and seamless integration of the data science code into existing solutions. The vast community ensures the availability of many libraries for data processing and cloud computing. Keeping your ETL (Extract, Transform, Load) code, data processing, and machine learning in the same ecosystem is definitely a good idea. The smart machine-to-machine communication supported by advancements in the Internet of Things (IoT) technologies will make programmers write completely different applications. In an IoT environment, various devices will “talk” to each other over the internet. At the same time, each connected device must contain an embedded application to communicate with other devices and exchange data. In contrast to other programming languages, Java is compatible with many devices and platforms. Apart from that, it additionally accelerates the development of embedded applications by providing a wide range of APIs and libraries. Most businesses nowadays use custom software to manage huge amounts of data gathered from various sources. Although Java does not possess built-in features to facilitate development of custom big data solutions, developers can take advantage of a wide range of development tools and frameworks to write them in Java at a rapid pace. Software development companies may consider, for example, Hadoop, Accumulo, HBase, ElasticSearch, and similar Java frameworks which help programmers build custom big data solutions in line with business needs. There are also a number of IDEs that can be applied for writing big data solutions in Java or Scala. With 12 million developers worldwide, Java remains the #1 language of choice by software programmers. Moreover, as the timely delivery of enhancements in Java 12 demonstrates, through uninterrupted thoughtful planning and ecosystem involvement, the Java platform has all the chances to develop and grow in the cloud. There are numerous reasons why Java keeps landing among the top technologies. It’s the combination of simplicity and robustness, the popularity of Android and web applications, and, surely, an enormous, friendly community. Despite the fact that no fundamentally new Java technologies are going to be delivered anytime soon, the platform is flourishing and has no intention to remain in the shadows. It perfectly manages to find the right balance between stability and innovation and does it gracefully. After all, 12 million can’t be wrong all at the same time. At Qulix Systems, we care about Java and are always looking forward to discuss modern Java technologies with you. So, if you have any questions, feel free to contact us at request@qulix.com.